TT: What’s on the Rooftop? Looking for the Wednesday Wandering? Page back one where I wander on about how gardening considerations and writing considerations are not as dissimilar as they might seem. Then join me and Alan as we examine our severely battered roofs. JANE: Hey, Alan, remember when I told you about how my house had been pummeled by hail, ruining the roof on the sun porch? ALAN: Yes, I do. It must have been a frightening experience. JANE: Turns out the repair is going to be a lot more complicated than anyone imagined at the time. The company that built the porch in the first place has gone out of business. Happily, for us, there is another company that makes a similar product, but the panels will need to be custom fabricated. We’re still waiting on that. Didn’t you tell me that you and Robin are having your roof replaced? I hope it’s going a lot more smoothly. ALAN: We’ve not had the whole roof replaced, but we have had some very extensive repairs. About a year ago, after a big storm, we had some leaks in the roof. The cats took exception to being dripped on, so we got a roof man to investigate. He told us that there was some corrosion round the nails, and he recommended that we have the nails replaced with screws and have the holes resealed. We did that (it took a couple of days) and the leaks went away. The cats were happy again. JANE: How cats react to storms is fascinating. Currently, Jim and I share our home with four. Each one reacted a little differently to our barrage of hail. Persephone went to the window to watch, then decided she’d seen enough and hid. Ogapoge – who is such a big bruiser that everyone assumes he is scared of nothing – went into his favorite hiding place, the file drawer in my desk. Kwahe’e looked as if he was going to get scared, took a look at me and Jim, decided we weren’t hiding, and snuggled down to await developments. My favorite reaction was Kel’s. She analyzed the situation, clearly decided one roof just might not be enough, and went into the knee-well on my desk. She didn’t hunker down or look scared. She looked as if she’d moved into a cat-sized residence. I hope that your repairs ended your problems. ALAN: Well, they did and they didn’t. Certainly the leak went away, but round about the time you had your hail damage, we had another big storm and the roof started to leak again. A different roof man came to investigate. He reported that the first man had not done a very good job – there were still nails and corrosion in some of the harder-to-reach nooks and crannies. So we had those fixed as well. JANE: Nails and screws? What sort of roof do you have? ALAN: The roof is made of corrugated steel which is nailed (well, screwed now) to the joists. That’s probably the most common roofing system here. I must confess that when I first came here from England, I thought it all looked a bit crude. I’d grown up in a house with a slate roof and when I bought a house of my own, it had a roof made of ceramic tiles. But I’ve got used to the look of steel roofs now and these days I rather like them. But there’s a dramatically rusty one on a house just down the road from us which really looks quite ugly. I can’t imagine how it stays watertight, if indeed it does. The house is generally very dilapidated so I suspect it’s a rental property. JANE: Interesting variations… I really don’t know what the roof was on the house where I spent most of my childhood. The house was so tall and the roof so steeply pitched that I never went out on it. I think the roof on the house where we summered was some variation on asphalt shingles. That’s a pretty common material here in the U.S. It’s what my current house has. However, I have lived in a house with a metal roof, when I lived in Virginia. ALAN: Ah! So it’s not just an antipodean phenomenon. That’s interesting. JANE: My house in Virginia was – by American standards – quite old. Most of it had been built before the Civil War. I think the “new” rooms were added in the 1880’s. The house was roofed in metal – what is usually called a “tin roof” here, although I have no idea if it was tin or some other metal. In any case, I was very surprised to learn that care for this roof included keeping it painted. Since the house was fairly tall and had a very steep pitch (I am seeing a trend), I arranged for the roof to be painted by professionals. My cats (a different crew then) were all quite calm until I made a flippant comment about there being monsters on the roof. Then, between one breath and the next, they all melted into hiding. Seriously. I do not exaggerate. I had a friend visiting at the time and he could bear me witness. ALAN: Our cats paid no attention at all to the man banging on the roof. But a couple of months ago the largest seagull I’ve ever seen in my life went stomping all over the roof with his size ten hob-nailed boots on. Every so often he stopped and had a really loud peck at something as well. He spent more than an hour marching around up there. The cats were initially puzzled, but then Harpo, the cat who isn’t afraid of anything except the things he is afraid of, went and hid in a deep, dark cupboard, and Bess came for a reassuring cuddle. JANE: Do you folks typically paint your roofs like I had to do? ALAN: Yes – lots of the roofs are painted. There’s always a section in paint shops devoted just to roof paint, though I’m really not sure what makes roof paint different from any other kind of paint. A house I lived in a few years ago had a roof that had been covered with some sort of adhesive which had what appeared to be gravel embedded in it. It looked very attractive and was highly effective at keeping the weather out. This entry was posted on June 19, 2014 at 1:00 am and is filed under Thursday Tangents. You can follow any responses to this entry through the RSS 2.0 feed. You can leave a response, or trackback from your own site. Um, flat roofs aren’t supposed to be flat, they’re supposed to be gently sloped (1-2%) so that the water runs off. That said, flat roofs are wonderful if you want to actually do something on your roof like, oh, sleep outside during the height of the summer, or have a little garden away from the street, or hold solar panels, or whatever. Steeply pitched roofs work better with shedding rain and snow. Ah… “Supposed to be…” That’s only part of the question. Stay tuned for great excitement and complexity! “Tin” roofing is usually galvanized steel. It contains (as far as I can determine) no tin at all (although tin cans and various forms of tinware do). The galvanization process instead involves a zinc coating. Jane, you may recall me talking about that when I was building my solar oven. I used galvanized steel to line the inside of the oven, which is very durable, but which came with some complications: it has the unfortunate property of off-gassing zinc when heated over 390 degrees–not good for food though not a problem with roofs. Also, it is hard to paint, which is probably one reason why roof paint is different than other paints. I have a “tin” roof and am pretty happy with it. From time to time I do have to make sure all the screws holding it in place are tight, otherwise it booms and drives me nuts when the wind blows hard. I hadn’t really thought about painting it, though. Eventually I supposed I’ll have to. The gravel roofing Alan describes sounds like gravel embedded in tar, which is a common roofing system here. It’s often used on flat roofs, in fact. I wonder why they’re called “tin roofs,” then… Is it because a “galvanized steel sundae” sounds very unappetizing? It’s left over from an earlier process which did use tin. I’ve never had a tin roof sundae, though I’ve heard of them. I grew up in a house with a red “tin” roof. It was rather soothing to lie on a bed reading while rain pitter-pattered on it. Other kinds of roofs just don’t have that sound. The roof that Alan mentions with gravel stuck to it, was marketed in New Zealand as a Decramastic tile roof. You can find images on google if you type “Decramastic” in. They were very popular until people discovered, after some years, that the coating wears off exposing the soft steel underneath. 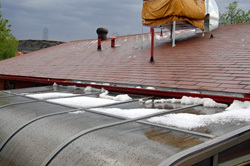 There are businesses that specialize in re-coating Decramastic roofs. Interesting! I don’t think it would work here. Too much heat.